Four of the group that were in Morpeth as part of the whistle-stop tour. Members of the group North East for EU, together with members of the European Movement, joined Angels for Europe on a recent whistle-stop tour of the four parliamentary constituencies of Northumberland. This mirrored Prime Minister Theresa May visiting all four UK nations on the anniversary of sending the Article 50 letter to the EU. The tour was organised to support a ‘people’s vote’ on the final Brexit deal. 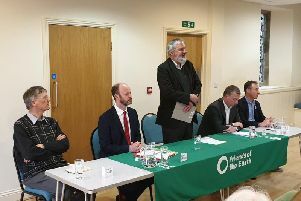 Remain supporters joined the group in each of the four towns, including Morpeth, to hand out leaflets and listen to the concerns of both Leavers and Remainers. A range of concerns were written on postcards by some of the people who engaged. They will be sent to their constituency MPs. Angels for Europe is a grassroots, all-party – and none – movement of people set up last year. It works in the county to ‘galvanise and give a voice to those 48 per cent who voted to remain in Europe’.